I actually have a skincare routine! This is big news for me, as Skincare is not my strong point, but just recently I have gotten into a routine. I have dry skin, which only gets worse in the Winter. This year I decided to do something about it, instead of moaning about it. 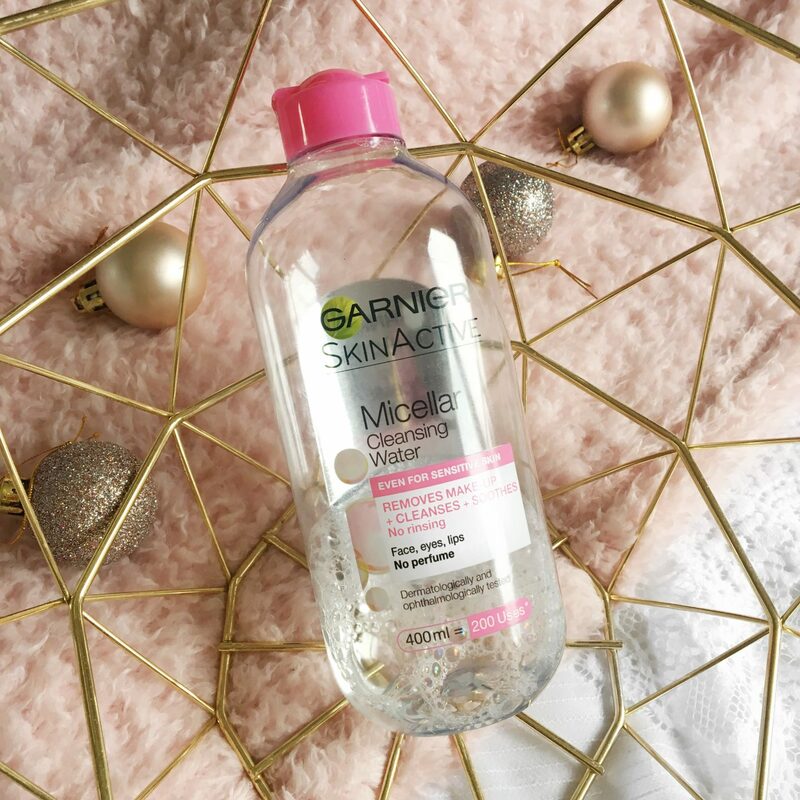 I start by taking my makeup off with the Garnier Micellar Water, by using a cotton pad and taking it all over my face. I’ve gone through countless bottles of this, and I couldn’t imagine using anything else. It’s affordable and does the job really well. After this I use a cleanser, and at the moment I’m using the Vitamin E Cream cleanser. This just makes sure all of the makeup is gone, and it leaves my face feeling clean and refreshed. When I first started looking into skincare I was told that Vitamin E is the best thing for dry skin. That led me straight to this range, and it hasn’t done me wrong. I’ve also started using a facial scrub, and this one is the Botanical Exfoliating Scrub by Mario Badescu. I got this after seeing Reece’s Instagram stories. This scrub is quite harsh, so it’s important not to be too rough and to avoid the under eye areas. I’ve noticed a real difference after using this, and my face feels a lot better. I use this about twice a week, or sometimes three times. I know this was on my Christmas list, but I ended up getting it myself. 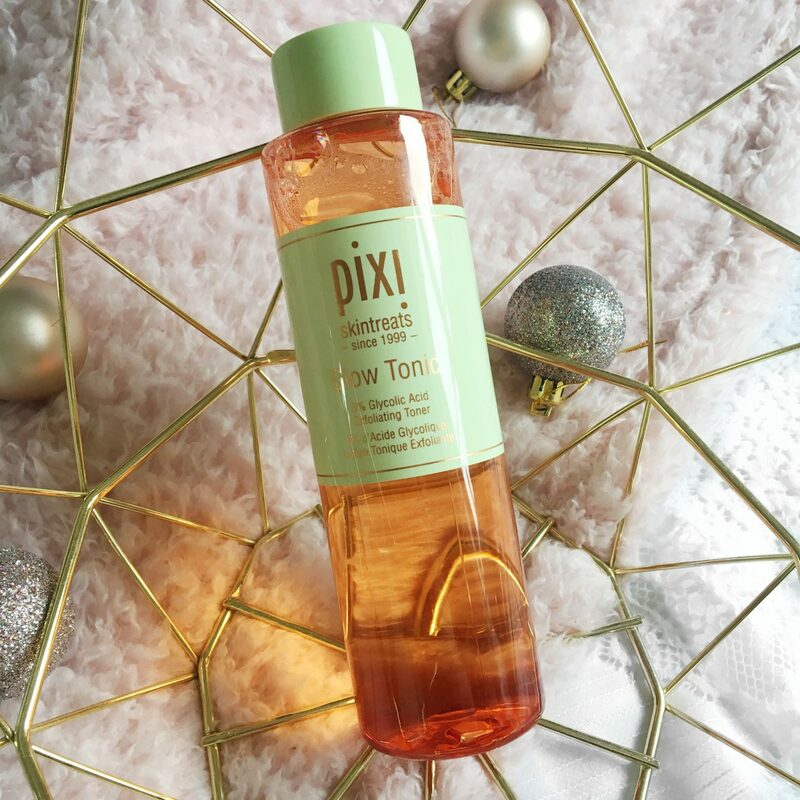 This is the Pixi Glow Tonic Toner. 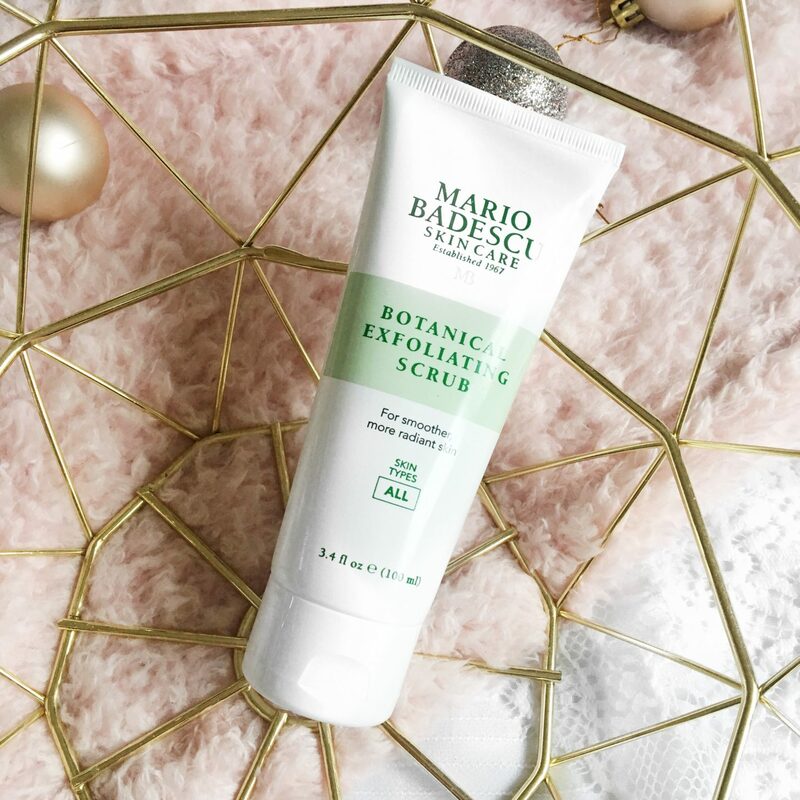 I use this on days when I’m not using the Mario Badescu exfoliator, as this is a gentle exfoliator. The only thing I hate about this is the scent, it has a really strong floral scent; that I was not expecting. Other than that I can completely understand the hype it gets. 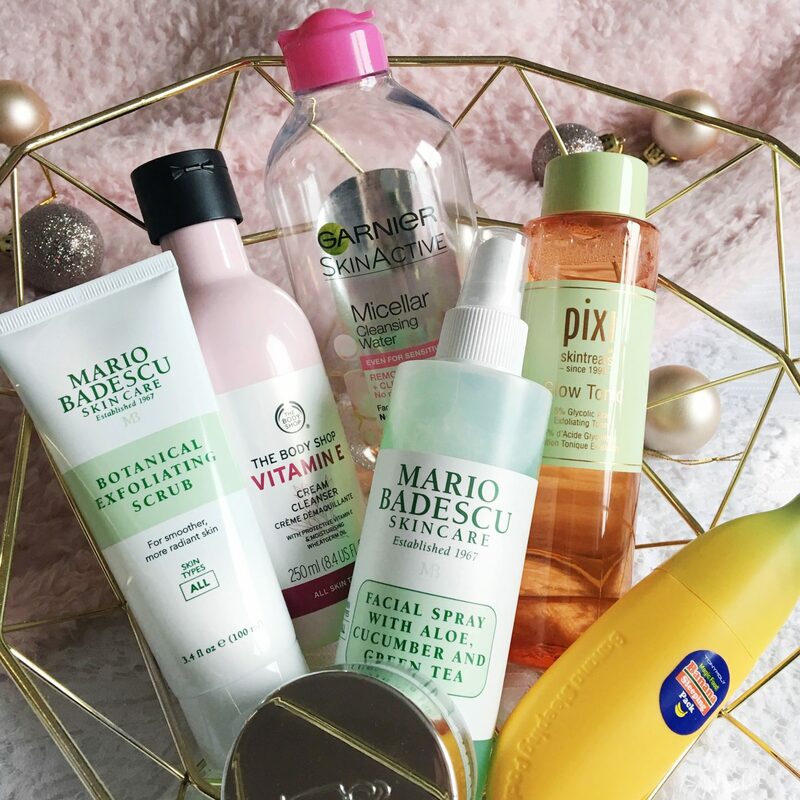 I love a product in a spray bottle, so I had to incorporate the Mario Badescu Facial Spray. I opted for the version with Aloe, Cucumber and Green Tea. In all honesty, I haven’t really noticed this doing anything, but I continue to use it anyway. I am going to start using it before and I after I do my makeup too, as hopefully that’ll help. 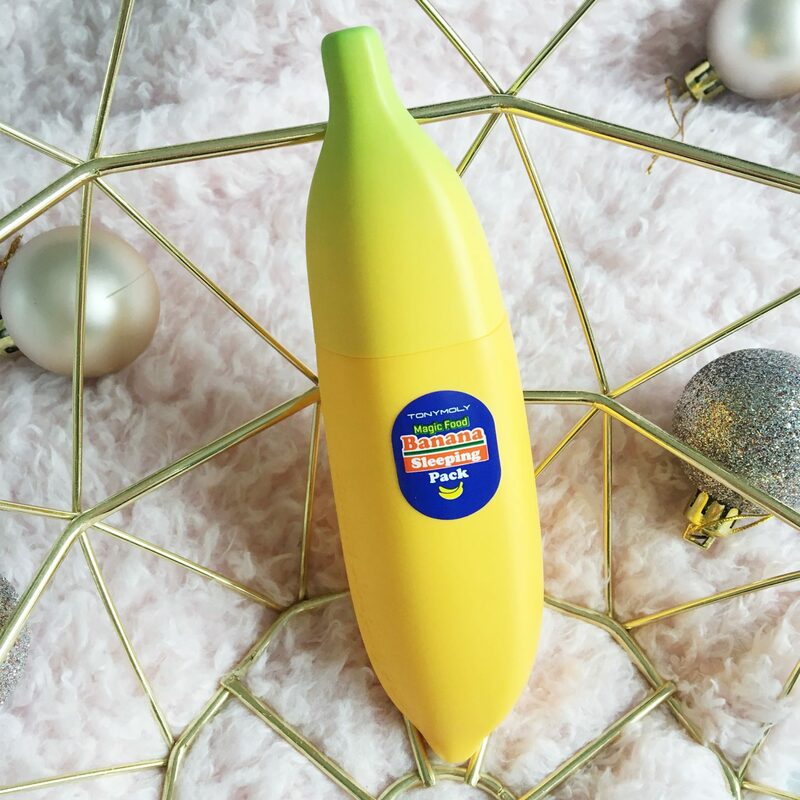 Award for the best packaging definitely goes to TonyMoly for this Banana Sleeping Mask! It is so cute, and definitely different to other sleeping masks out there. I first heard about this from SophDoesNails, and I knew straight away that I had to get it. It smells exactly like fresh bananas, you know how sometimes it can be an artificial smell? Not this one. It’s so thick too, and you can really feel it working. Whenever I use this I always wake up with visibly softer skin. I can’t rave about this enough. If you’re looking for a new nightly moisturiser you need to give this a try. Finally for the last thing. This is the Instytutum eye cream, and I’ve been using this for a while now. The only thing I dislike about this, is the hefty price tag. In all fairness it is lasting an incredibly long time, as you don’t need that much. This is leaving my under eye areas visibly brighter and helping to reduce the look of my under eye circles. There we have it. They are all the products I have been using. As you can tell from this old nightly routine, my skin care routine has come a long way. I would love to hear about your favourite skincare bits too. "Blogmas Day 18: Kiko Glow Fusion 01 Brilliant Champagne Review"
"Blogmas Day 20: Battle of the Foundations: Max Factor VS Milani"
This is sooo useful as I have dry skin and trying to find some new skincare products. I would love to try the Pixi toner. I have to check out the Pix tonice! I use the Mario Badescu rosewater mist, which is amazing–you should try that one, it’s hydrating and smells amazing. The botanical scrub is a great one but I only use it once a week not twice, since I have sensitive skin. I’ve *almost* been sucked in by the Pixi Glow Tonic hype. Not sure why I always fall short of actually purchasing the stuff. Perhaps it’s because I’ve never really been one for toner? 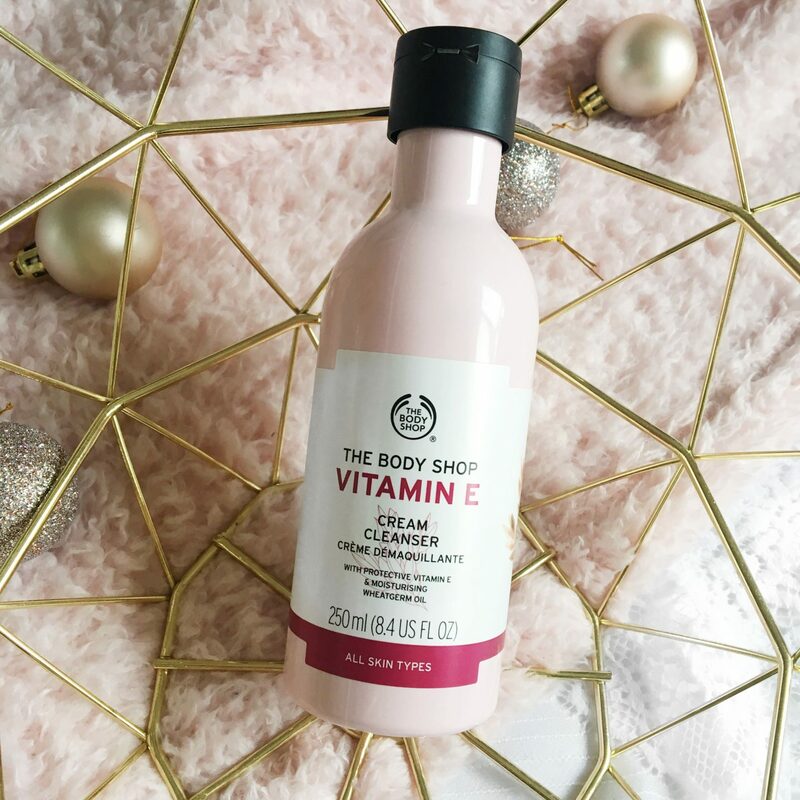 I do love the Body Shop Vitamin E range though. 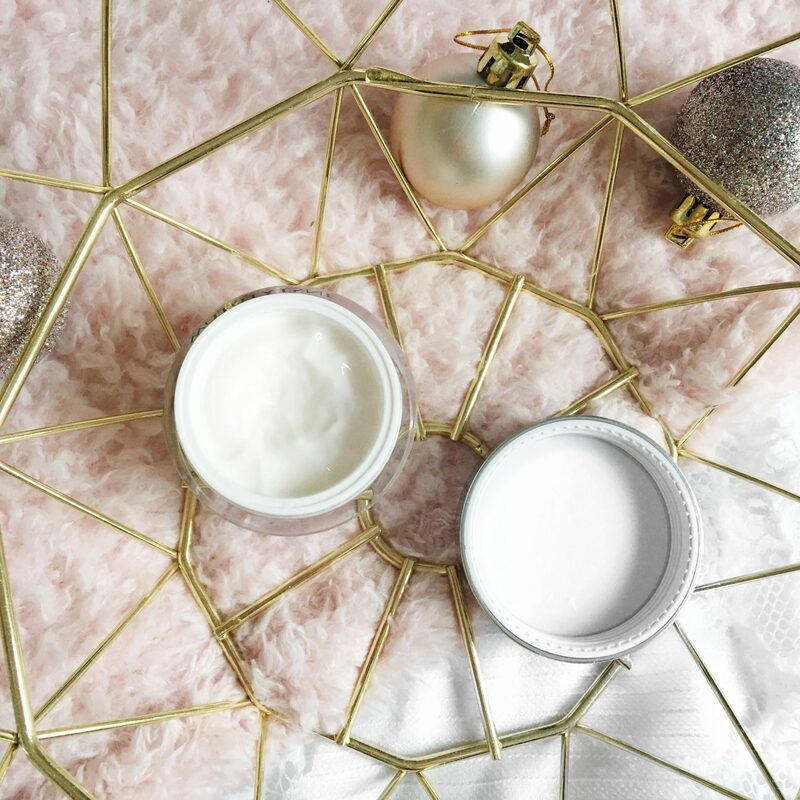 The overnight mask is divine, and I use the moisturiser twice a day during the winter. It’s an instant pick me up. Anyway, very useful post, I look forward to reading more! Hi there, thank you for stopping by! It took me a while to finally give it a go too, but once you start you don’t look back haha! I’ve not tried the overnight mask, but it sounds so good! I’ll definitely have to look into it! 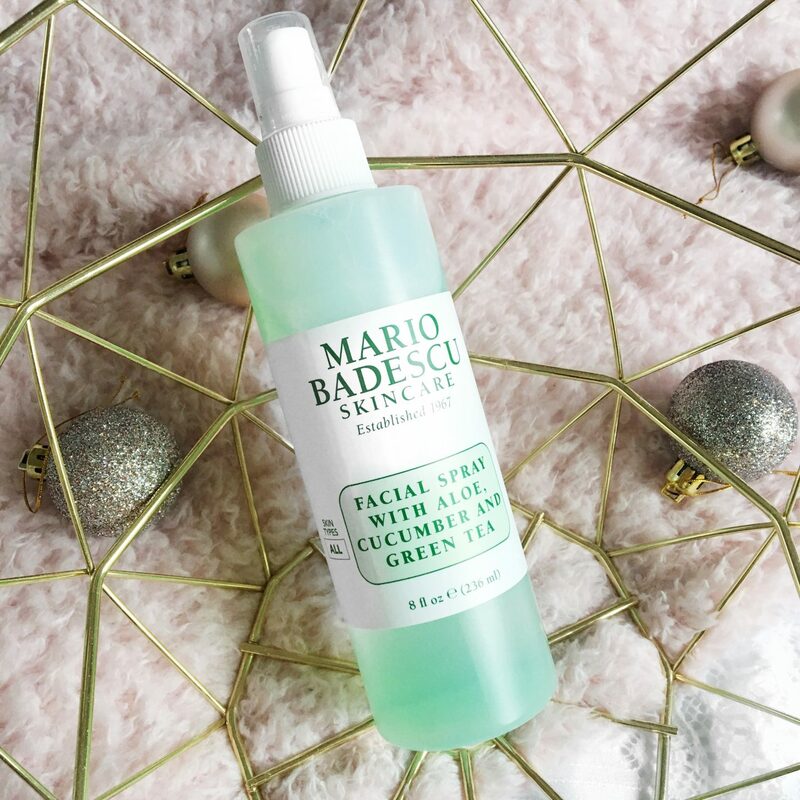 I’ve been hearing great things about the mario badescu facial sprays, it’s time I try one for myself. I am nuts about their drying lotion and overall they are quite an affordable brand. Really enjoyed reading this post! I wanted to try one of the Mario Badescu sprays but I don’t feel like it would be doing much. I have the Sukin facial mist which I’m continuing to use until it’s finished but I don’t notice much with it!